It’s upsetting to see a defence of tyranny coming from a citizen of a free nation. 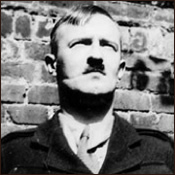 Lord Haw Haw, otherwise known as William Joyce, did his level best to demoralise English-speaking Allied soliders with his radio broadcasts during World War II; he performed this service for a regime that slaughtered 6 million Jews in the Holocaust and inflicted unfathomable suffering on the nations of Europe. But the most elaborate code of this sort would still have left unspecified a hundred ways in which wreckers of Communism could have sidetracked it without ever having to face the essential questions: are you pulling your weight in the social boat? are you giving more trouble than you are worth? have you earned the privilege of living in a civilized community? That is why the Russians were forced to set up an Inquisition or Star Chamber, called at first the Cheka and now the Gay Pay Oo (OGPU), to go into these questions and “liquidate” persons who could not answer them satisfactorily. It’s just as unforgiveable that a man of Shaw’s intelligence and erudition didn’t know or rather, didn’t allow himself to know about the Russian state’s tradition of organising Potemkin villages nor had sufficient curiosity to delve into the reports about widespread famine in the Ukraine which was created by forced collectivisation of agriculture. To this day, it is difficult to say precisely how many millions died of starvation and the Great Terror, both of which were imposed by Stalin. Estimates range up to 12 million in total. It’s distressing that denials persist in spite of the truth having been revealed. The mass graves filled with victims of the Soviet famine and purges have been dug up; people can go visit Auschwitz. Kneel among the tall grass near the crematoria. Stick your finger in the dirt: there are still flecks of human bone which were belched out of the chimneys. Yet, neo-Nazis across Europe say it never happened, it’s all a fabrication, or if it did, the death toll is exaggerated. Unreconstructed old-style Communists don’t want to talk about the casualties inflicted by Stalin’s Russia and for the most part the remains of labour camps scattered throughout the former Soviet Union lay rotting. People rarely read Solzhenitsyn’s “One Day in the Life of Ivan Denisovich” these days and thus are less aware of the grisly conditions once suffered by Soviet political prisoners. Forget, forget, let mass murder be obscured and disappear from the memory of the living, the avatars of fascism and Stalinism suggest. Indeed, the process of forgetting is so pronounced that as the BBC’s Panorama programme recently pointed out, Neo-Nazism has made inroads with football supporters in Poland and Ukraine, two nations which suffered terribly at the hands of the Fascists. It makes absolutely no sense: but then again, perhaps the Polish and Ukranian Nazis don’t mind racism so long as they’re not on the receiving end of it. Note the words used: the protestors are “losers” and the “Syrian Soldier” considers them “brainwashed”. He could not do more to malign, defame and debase those who have been protesting for both dignity and freedom; he doesn’t want to acknowledge that rising up was the only option left, given that the regime’s response to any form of dissent was arrest, torture and repression. The overwhelming body of evidence is that this is happening: yet servile, feckless and frankly nasty avatars of the Assad regime hope to swamp such arguments in a sea of bile. It is difficult to accurately describe such people without descending into a cellar full of colourful epithets. It would seem opprobrium does not deter them: on my Twitter stream one such individual dared to reply to a comment I made about a documentary concerning the Assad couple. I merely told him that he was a servant of a vile, murderous regime and “Good-bye”. I blocked him. It would be pleasant to think that merely saying “Good-bye” and clicking a link would push such people to the margins of discourse; what’s frightening is that they share the mindset of those who are doing the killing. “Brainwashed losers”, the “Syrian Solider” says. Dismiss, dehumanise, then ready, aim, and fire. Houla drowns in a sea of blood: the front page of the today’s Times reminds us that women and children were executed in an indiscriminate fashion by Assad’s thugs. Nevertheless, Russia Today has hitherto spewed forth nonsense backing up the regime and the Russians show continued reticence in dealing effectively with Assad. We in the West sit on our hands, unable to act in a meaningful way, indeed barely able to speak with one voice; the co-ordinated expulsion of Syrian diplomats is unlikely to trouble the regime substantially. The West frets and wonders what might have been while Syria bleeds and the likes of “Syrian Soldier” suggest this is precisely what the “brainwashed losers” deserved. It’s tempting to think that the facts are too potent for even Assad’s most ardent supporters to deny, that they might cast an askew glance in the mirror and be horrified by their own reflection. However, the kind of arguments one would have with Assad’s supporters or neo-Nazis or Stalinist throwbacks are not the sort of disagreements which arise from a differing interpretation of the facts, rather it is a contest between the truth and falsehood, between objective reality and propaganda. Those who say that the Nazis didn’t kill 6 million Jews are completely inaccurate. Those who say Stalin wasn’t behind the Ukrainian famine and the Great Terror are not being true to history. Those who say Assad and his thugs are not responsible for the massacre at Houla are perpetuating a lie. No doubt they regard themselves as defenders of the truth, an easy, simple delusion which soothes whatever pangs of conscience may remain, but reality does not support their precarious position. Nevertheless, presumably they would rather fall with the lie than accept the rigours of the truth, hence the violence and vehemence in their words. Perhaps we shouldn’t be surprised. Tyranny only works if people are willing to accept falsehoods, either wholeheartedly or by being resigned to them. The latter category deserves sympathy and support: as it was during Soviet-style Communism, people could not be free without the ability to embrace the truth. Doublethink is a recipe for an ill society, as the last gruesome years of Ceausescu’s Romania showed; those who rise above it are the truly brave. In contrast, the former category are, frankly, monstrous. An alliterative moniker I once heard on American talk radio will suffice in labelling them: they are the “toadies of tyranny”. They aid it, abet it, propagate it. It is with these people that battle is joined: not just by those who resist on the streets of Homs or Houla, but also by those elsewhere who can respond to blatant, twisted propaganda with an unending chorus of fact, reportage, free debate and a stubborn refusal to accept lying. I have no doubt that Assad will fall; he lacks the guile of his father and the oil revenues of his deceased counterpart in Libya. At some point, the majority of the army will be unable to stomach any more killing of their own people; this was the case during the last days of the Soviet Union when the hardliners attempted an ill-fated coup. Once the Assad regime is gone, then there will be a point of decision as to which way the Syrian people will want to go: the direction they will take is entirely up to them. That moment is laden with hope. Regardless of the path chosen, there will be those who will continue to harp on the days of Assad as some sort of halcyon era, one to which Syria should return: they will hope the passage of time will cloud the memory of Hamza Ali al-Khateeb’s broken remains and the innocent dead of Houla lying in a mass grave. The toadies of tyranny will still need to be defeated long after they are vanquished.